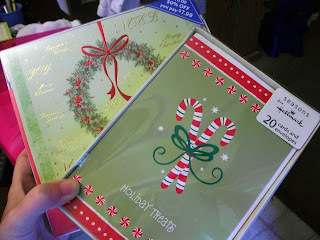 Thrifty Crafty Girl: 25 Days of Christmas - Christmas Cards, I Hardly Knew Ye. 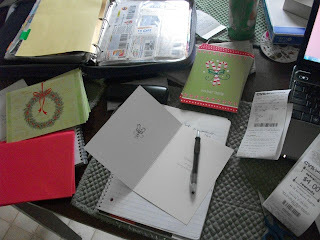 25 Days of Christmas - Christmas Cards, I Hardly Knew Ye. So, I'm a little busy lately. I don't think I mentioned to you yet but my husband broke our car. Our ONLY car. He broke it. It's way broken. $2,500 of broken. So, I've been mired in all sorts of insurance deductible/still need to run the house/and the blog/weeping on the phone to the mechanic that he'd better not hurt my baby. It's been a rough week. Still, the Christmas cards need to go out, so on with the work. 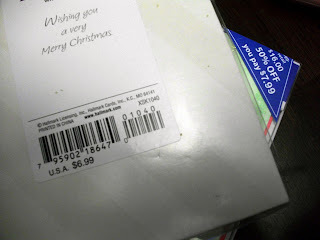 I got Christmas cards on clearance last year... 90% off. Cha-ching. Then came time to write them out and send them off... which was totally peaceful, as it should be, right? 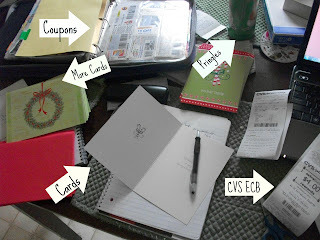 I was writing, addressing and sealing Christmas cards, examining my CVS transaction from that morning because one of my ECBs didn't print, trying to organize my coupons and match them up with the sales, and eating Pringles. Actually that last one wasn't so hard. Years ago, while talking with a friend, I told her that I was going to make a spreadsheet for the Christmas card list so I could do a mail merge and print all of the addresses onto labels and print labels with a holiday message. I could have the kids put the labels in the cards and sip hot chocolate while I break several child labor laws. She told me that Christmas cards shouldn't be a chore and I should take the time to write out each one to make the recipient feel special. Why did she have to tell me that? I was perfectly happy breaking etiquette without knowing I was doing so. 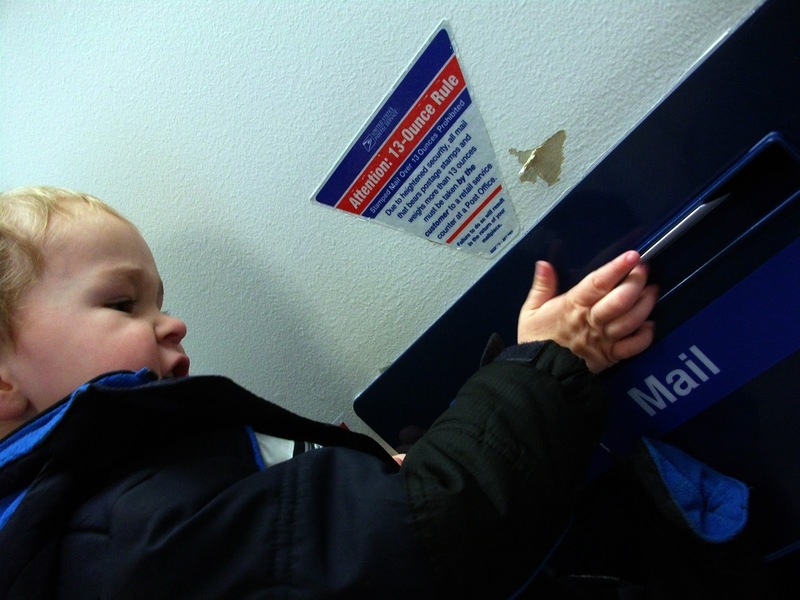 He refuses to get a job like responsible toddlers, so I made him put them in the slot. That'll teach him. Have you sent your cards out yet? The child labour in this post made me smile, which is an odd thing to say!! Sorry about your car -- NOT what you need this time of the year! Your little worker is a cutie! Heehee! Cute pic of your little guy!